Yes, lightbulbs and/or spots are indeed the way to go. A purplish light inside that orange corridor and an orange light in the purple room in front. Making the purple and orange for the lights the same colour as the lighting in the rooms will get you the best results. You may have to adjust intensity and distance for the best results. I installed TREP (latest version, I think), and put it in my trle folder. I made a patch on it and clicked "modify". It didn't update my tomb4.exe, it actually got deleted? Any ideas how do I fix this? "Right now, crazy is all we got"
It looks that way, but it didn't. TREP deletes the un-patched exe and inserts a new one. Leave the folder. When you re-open it, the new exe will show. A warning: keep a backup of the original exe, before you begin to work with TREP. Sometimes the patched exe becomes buggy, and you will have to try again with a fresh version. JesseG wrote: Just make sure there's only ONE sun bulb in each room (more than one is not allowed). I wonder, if that's because computers back in the days were weaker. Someone once tried (and so have I) to see, what happens with more than one sun in a room. Aside from a warning during the output of the wad, everything seems to work just fine. I have a room with two suns in a tiny epilogue-level and four suns in a room in a test-level. The four suns have four different colours and give a very disco-like effect. But I would be careful about using this feature very much. TREP deletes the un-patched exe and inserts a new one. It didn't insert a new one since while updating the Tomb4.exe suddenly it says that the file is not found and it doesn't do the rest, I have to cancel it then. Oh nevermind I fixed this. When I saw that the file couldn't be found, the file was supposed to be called tomb4.exe0 so I made a copy of my tomb4 and renamed it to Tomb4.exe0 and it updated. Do I need to do something else so the changes work or I can just click tomb4.exe and see the changes? How do I make this kind of looking waterfall? Does it come as a WATERFALL object or you can actually make one in the NGLE editor? I don't really wanna try making waterfalls with textures. I wanna make these on the picture. 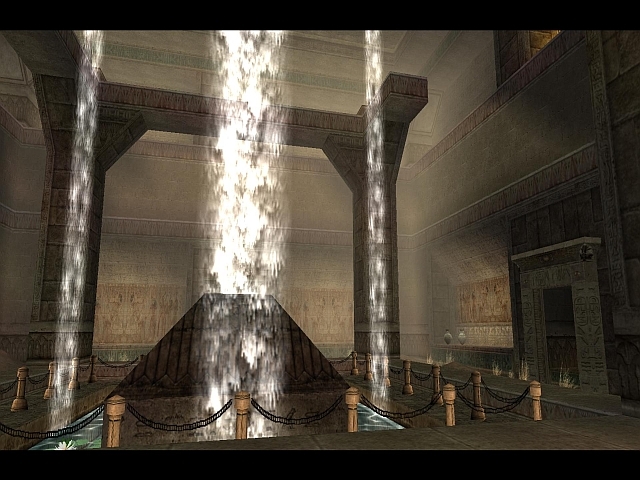 These are custom objects that have had the TR4 Library waterfall texture applied to them. While you could achieve pretty much the same effect as that shown in the image by applying waterfall textures to Toggle Opacity 2 portals, that would involve splitting the room shown into several smaller ones, as well as stacking several layers of them on top of each other—a quite ineffective use of resources in this instance. By contrast, an object such as this is easy to make, and easy to place on the map.